In the Abbey Churchyard, opposite the main entrance to the Clark Town Hall. And taught me her beauties to sing. was taken from the old house, which had fallen into great disrepair. 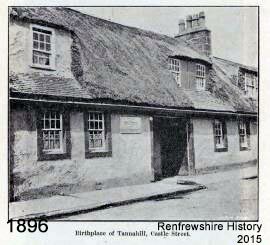 The centenary of Tannahill was publicly celebrated in Paisley in the year 1874. A procession to, and concert at, The Glen, and a public banquet attended by the leading -citizens, attested the esteem in which the memory of the gentle weaver poet is held by, all classes of the community. Queen Street (next street), west of Castle Street, approached through Cross Street. 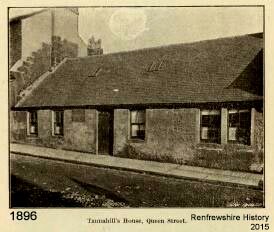 Tannahill’s parents having built and removed to this house while he was still young, it was here that he spent his early days, and those of his ripe and productive manhood. 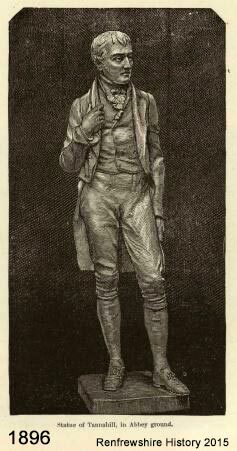 Here he lived and laboured, and here his body was brought after his lamented death in May, 1810. It is recorded that Tannahill fixed a rude little desk in such a position on his loom that he could there write down the fancies which struck his brain while his web was progressing. Doubtless those exquisite Scottish lyrics, “Gloomy Winter’s noo awa’,” “The Braes o’ Gleniffer,” “Bonnie Wood o’ Craigielea,” and many other of the sweet songs associated with his name were composed by Tannahill within this building. Numerous editions of his poems and songs have been published, the best among these being The Centenary Edition, by David Semple, Writer, which forms a fitting literary memorial of the distinguished lyrist. 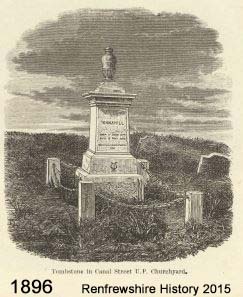 ERECTED OVER THE REMAINS OF THE POET, 1867.